Go beyond the usual tourist attractions. Sure, it’s a bummer that the GDA isn’t pushing through in Manila anymore. But if you happen to be in Korea on January 10 to 11 (or if you really want to splurge on it), the star-studded production will be held in the Korea International Exhibition Center or KINTEX in Goyang, Gyeonggi Province. Alternatively, you can catch a major K-pop act on January 13 or 14: none other than BTS. They don’t have a confirmed schedule yet when it comes to concerts elsewhere, so if you want to watch them fresh from all the hype of their AMA performance, this is your chance! If you will be there this January or February, why don’t you try skiing, snowboarding, or sledding? Where better to do it than this picturesque Goblin filming location? 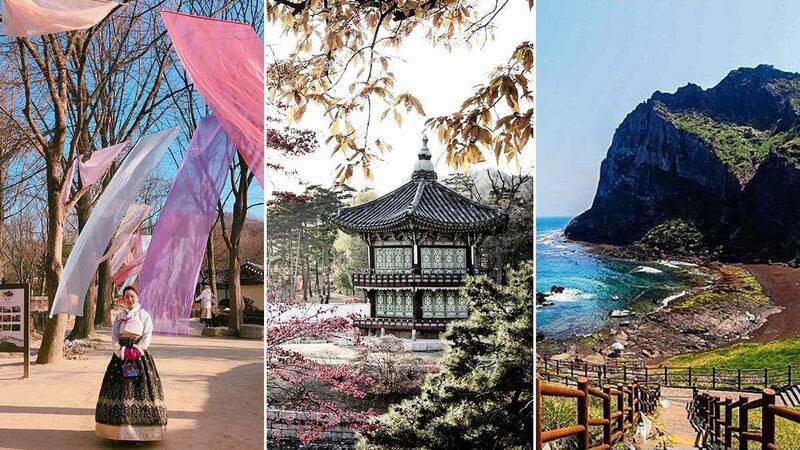 This is the perfect destination if you’re the type to enjoy playgrounds for adults or if you’re simply a fan of the Korean variety show Running Man. Try out the thrilling games, escape mazes, and collect R-points and coins like what they do on the show. Here’s another must-visit spot during springtime where you can enjoy the Jinhae Cherry Blossom Festival. Some tourists even say the cherry blossoms in Busan can be prettier than the ones in Seoul, so prepare to be in awe and take a bunch of photos! Okay, this one is usually included in itineraries. But by 2018, the restoration work being done in a major section of the palace should be finished already, and that’s something worth seeing. If you happened to book cheap tickets to South Korea around summertime, you might want to hit one of the grandest water parks there. Cool off, enjoy the thrilling rides, and relax in the special pools beneficial to your health. And if your budget and itinerary allows it, fly to the popular tourist spot, Jeju Island! There are plenty of ~*dreamy*~ spots you can explore and swim in, Make sure to visit during swimming season (usually starts by June or July). Here’s another beach you ought to visit, and you can get there easily via train. Again, if you want to take a dip, visit during swimming season. For anyone looking for some peace and ultimate quiet, this is the perfect alternative to the usual accommodations. There are various temple stay programs, but the usual activities include trekking through serene forest trails, tea sessions, and meditation. If you sorely miss the Goblin, here’s another epic filming site you can visit: the buckwheat flower field of Bongpyeong. You can check it out when the flowers are in full bloom, usually during the Hyoseok Cultural Festival. This one’s for historical drama fans. This village lets you feel like you’ve transported back into the Goryeo or Joseon Dynasty. Unlike the more accessible and popular Bukchon Hanok Village, this one in Gyeonggi-do also makes room for cultural performances and stores of traditional rice cakes. For movie buffs, this deserves a spot in your itinerary if you’re in Korea on October. Not only is it possible to see some big celebs during the festival proper, but you also see the best films of the country. For lovers of the wonderful gastronomic creation bibimbap, you have to visit the city best known for the dish at least once in your life. You can even time your trip during the Jeonju Bibimbap Festival in October for a full-on celebration or visit during off-peak seasons to enjoy the calm of the so-called ~Slow~ City. The stream attracts tourists all year round, but the busiest time for it annually is when the Seoul Lantern Festival is held in November. During this time, you’ll be fascinated by the grand lanterns depicting Korean culture or history, folk tales, and even modern culture. As the largest undergound shopping center in Asia, the COEX Mall has something for everyone. Recently, it has even opened a huuuge and totally IG-worthy library called Starfield. Time to go bargain-hunting for clothes, beauty products, books, and more!